One of the most persistent and pernicious myths in the history of astronomy is that Galileo, with his telescopic observations, proved the validity of the Copernican heliocentric hypothesis and thus all opposition to it from that point on was purely based on ignorance and blind religious prejudice. Strangely, this version of the story is particularly popular amongst gnu atheists. I say strangely because these are just the people who pride themselves on only believing the facts and basing all their judgements on the evidence. Even Galileo knew that the evidence produced by his telescopic observations only disproved some aspects of Aristotelian cosmology and full scale Ptolemaic astronomy but other Tychonic and semi-Tychonic geocentric models still fit the available facts. A well as this the evidence was still a long way from proving the existence of a heliocentric model and many physical aspects spoke strongly against a moving earth. Put another way, the scientific debate on geocentrism versus heliocentrism was still wide open with geocentrism still in the most favourable position. Apart from the inconclusiveness of the telescopic observations and the problems of the physics of a moving earth there were other astronomical arguments against heliocentricity at the time that remain largely unknown today. 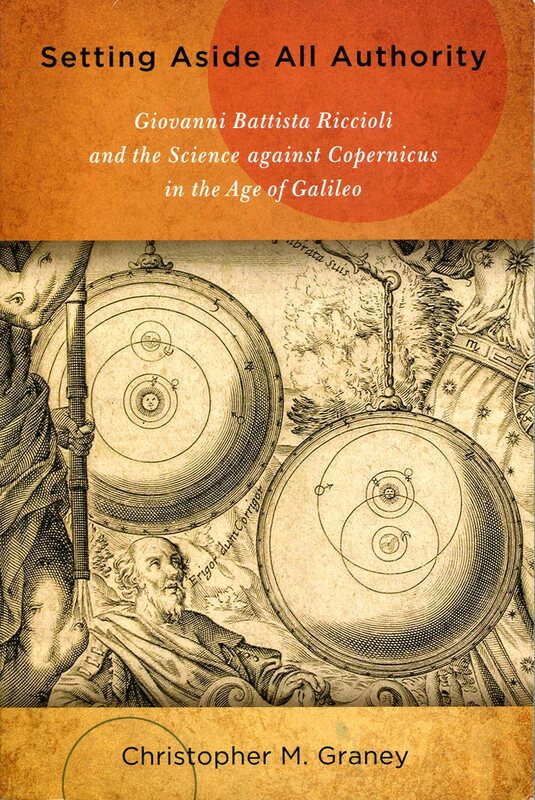 Christopher M. Graney has done the history of astronomy community a big service in uncovering those arguments and presenting them in his new book Setting Aside All Authority: Giovanni Battista Riccioli and the Science against Copernicus in the Age of Galileo. We’ll start with the general summary, as I’ve already stated in an earlier post this is an excellent five star plus book and if you have any interest in this critical period of transition in the history of astronomy then it is quite simply an obligatory text that you must read. So if you follow my advice, what are you getting for your money? In 1651 the Jesuit astronomer Giovanni Battista Riccioli published his Almagestum Novum or New Almagest , which contains a list of 126 arguments concerning the motion of the earth, i.e. the heliocentric hypothesis, 49 for and 77 against and it is this list that provides the intellectual scaffolding for Graney’s book. Interestingly in discussion on seventeenth-century astronomy Riccioli’s book, and its list, has largely been dismissed or ignored in the past. The prevailing attitudes in the past seem to have been either it’s a book by a Jesuit so it must be religious and thus uninteresting or, as was taught to me, it’s a historical account of pre-Galilean astronomy and thus uninteresting. In fact before Graney and his wife undertook the work this list had never even been translated into English. As to the first objections only a few of Riccioli’s arguments are based on religion and as Graney points out Riccioli does not consider them to be very important compared with the scientific arguments. As to the second argument Riccioli’s account is anything but historical but reflects the real debate over heliocentrism that was taking place in the middle of the seventeenth century. The strongest scientific argument contra Copernicus, which occupies pride of place in Graney’s book, is the so-called star size argument, which in fact predates both Galileo and the telescope and was first posited by Tycho Brahe. Based on his determination of the visible diameter of a star, Tycho calculated that for the stars to be far enough away so as to display no visible parallax, as required by a Copernican model with a moving earth, then they must be in reality unimaginably gigantic. A single star would have the same diameter as Saturn’s orbit around the sun. These dimensions for the stars didn’t just appear to Tycho to be completely irrational and so unacceptable. In a Tychonic cosmos, however, with its much smaller dimensions the stars would have a much more rational size. Should anyone think that this argument was not taken seriously, much later in the seventeenth century Christiaan Huygens considered the star size problem to be Tycho’s principle argument against Copernicus. Many, more modern, historians dismissed the star size problem through the mistaken belief that the telescope had solved the problem by showing that stars are mere points of light and Tycho’s determined star diameters were merely an illusion caused by atmospheric refractions. In fact the opposite was true, early telescopes as used by Galileo and Simon Marius, amongst others, showed the stars to have solid disc shaped bodies like the planets and thus confirming Tycho’s calculations. Marius used this fact to argue scientifically for a Tychonic cosmos whilst Galileo tried to dodge the issue. We now know that what those early telescopic astronomers saw was not the bodies of stars but Airy discs an optical artefact caused by diffraction and the narrow aperture of the telescope and so the whole star size argument is in fact bogus. However it was first Edmond Halley at the beginning of the eighteenth century who surmised that these observed discs were in fact not real. Graney details the whole history of the star size argument from Tycho down to Huygens revealing some interesting aspect along the way. For example the early Copernicans answered Tycho’s objections not with scientific arguments but with religious ones, along the lines of that’s the way God planned it! Although the star size argument was the strongest scientific argument contra Copernicus it was by no means the only one and Graney gives detailed coverage of the whole range offering arguments and counter arguments, as presented by the participants in the seventeenth-century debate. Of interest particular here is Riccioli’s anticipation of the so-called Coriolis effect, which he failed to detect experimental thus rejecting a moving earth. Far from being a decided issue since 1610 when Galileo published his Sidereus Nuncius heliocentricity remained a scientifically disputed hypothesis for most of the seventeenth century. Graney’s book is excellently written and clear and easy to understand even for the non-physicists and astronomers. He explains clearly and simply the, sometimes complex, physical and mathematical arguments and it is clear from his writing style that he must be a very good college teacher. The book is well illustrated, has an extensive bibliography and a useful index. As a bonus the book contains two appendixes. The first is a translation (together with the original Latin text) and technical discussion of Francesco Ingoli’s 1616 Essay to Galileo, a never published but highly important document in the on going discussion on heliocentricity; Ingoli a Catholic cleric argued in favour of the Tychonic system. The second appendix is a translation (together with the original Latin text) and technical discussion of Riccioli’s Reports Regarding His Experiments with Falling Bodies. These experiments are of historical interest as they demonstrate Riccioli’s abilities, as a physicist, as he delivered the first empirical confirmation of Galileo’s laws of fall. Graney’s book is a first class addition to the literature on the history of astronomy in the seventeenth century and an absolute must read for anyone claiming serious interest in the topic. 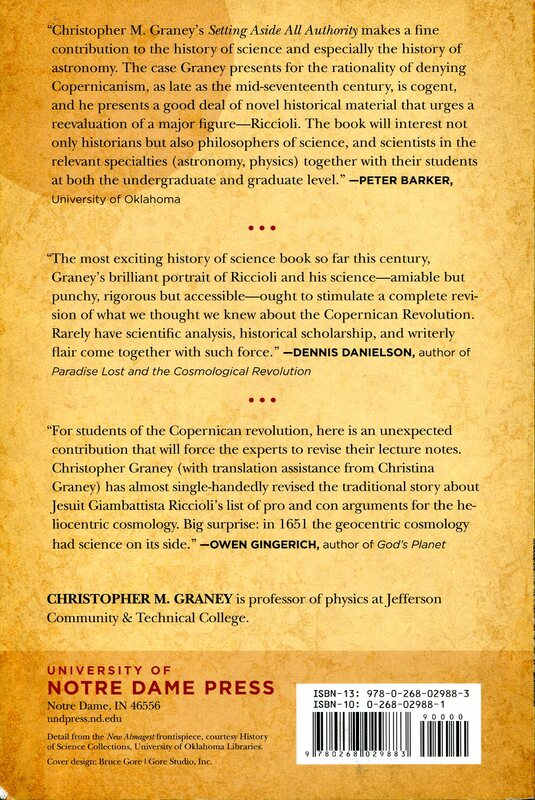 If you don’t believe me read what Peter Barker, Dennis Danielson and Owen Gingerich, all first class historians of Early Modern astronomy, have to say on the back cover of the book. Disclosure; Chris Graney is not only a colleague, but he and his wife, Christina, are also personal friends of mine. Beyond that, Chris has written, at my request, several guest blogs here at the Renaissance Mathematicus, all of which were based on his research for the book. Even more relevant I was, purely by accident I hasten to add, one of those responsible for sending Chris off on the historical trail that led to him writing this book; a fact that is acknowledged on page xiv of the introduction. All of this, of course, disqualifies me as an impartial reviewer of this book but I’m going to review it anyway. Anybody who knows me, knows that I don’t pull punches and when the subject is history of science I don’t do favours for friends. If I thought Chris’ book was not up to par I might refrain from reviewing it and explain to him privately why. If I thought the book was truly bad I would warn him privately and still write a negative review to keep people from wasting their time with it. However, thankfully, none of this is the case, so I could with a clear conscience write the positive review you are reading. If you don’t trust my impartiality, fair enough, read somebody else’s review. I read this book two weeks ago in between moving boxes to my new flat and I can confirm that Thony’s praise for it is indeed fully justifiedr. It is an excellent and highly useful publication – a bit more ‘popular’ than I would have personally needed, but I definitely see the merit of making the topic accessible to a wider audience. typo alert: it’s Peter Barker, not Baker. Thanks for the review Thony. And thanks also Baerista for the comments. I am just a blue collar pleb on a bottom feeders wage but I will definitely be purchasing this book. “These dimensions for the stars didn’t just appear to Tycho to be completely irrational and so unacceptable. ”; shouldn’t that be “rational” ? Parsing problem. Thony means “didn’t just appear to be completely irrational and, thus, because they were irrational, unacceptable” whereas JBauer parsed the “didn’t” as referring to “irrational” but it actually refers to “just appear”. Obviously, if “didn’t” refers to “irrational”, it doesn’t make sense, hence the suggestion that it should be “rational”. I conclude that the sentence, like some funny newspaper headlines, is ambiguous. Ambiguity is in the eye of the beholder. Just out of (academic) curiosity, could you share which of Riccioli’s arguments _were_ religion-based? He notes (and dismisses) two religion-based arguments. One was about eclipses and death of Christ. Riccioli considers this to be gibberish. The other was about where hell would be located were the Earth not the center (bottom) of the universe. Riccioli notes that hell is not a matter of place. If you click on the link in the line ” In fact before Graney and his wife undertook the work this list had never even been translated into English.” above it brings you to a blog post about the Graneys’ translation of the 126 arguments where you can find a link to Chris’ arXiv paper containing the translation then you can read them for yourself. I am so pleased by the review Thony — I am glad you liked it. I see a number of commenters have made favorable remarks as well (in reply to a couple of different blog postings). /Setting Aside/ is the first book I have had published, so it is nice to get so much positive feedback. I haven’t really understood the star size argument before now. Thanks a lot. Graney seems to be thebook. The point (pun intended) is that they don’t appear as points to the eye, but rather as small disks. Tycho, being ignorant of wave optics, took this to be the true angular size, which would imply that they are much larger than the Sun if far enough away not to show parallax. Tycho’s system is often painted as a compromise, something to save the appearance of a stationary Earth but having the advantages of the Copernican system. (Of course, in terms of relative motion they are equivalent but, as Weinberg points out clearly where most authors don’t, this can also be true of Ptolemy’s system.) However, his motivation was observational. In other respects (such as not marrying the mother of his children) it doesn’t seem to me that Tycho was too worried about rocking the boat. By the way, that’s Tycho, my eldest son (now 21) and myself in my avatar. Of course, in either system, if the stars are similar to the Sun, an apparent angular size of a minute of arc or so implies that they must be much less bright than the Sun. Huygens later estimated the distance of Sirius by determining which size hole in a metal plate, when held between his head and the Sun, looked as bright as Sirius, assuming the intrinsic brightness is the same. 1) Magini proved the mathematical equivalence of a Ptolemaic and the Copernican system in the sixteenth century, which is related in many history of astronomy books for so much for your or is it Weinberg’s claim. 2) According to sixteenth-century Danish law Tycho and Kirsten were legally married. 2) Let’s just say that there was no formal wedding, though as you point out it was recognized, I guess like common-law marriages in some places. I don’t know how common such morganatic marriages were, but I think they weren’t the rule. Thony remarked in that post that he sits “in a small flat, in a small village in Middle Franconia physically cut off from the rest of the world but through the medium of the Internet I am an integral part of a flourishing history of science community that is still growing and the members of which can communicate with each other instantly on a daily basis exchanging ideas or sending papers, theses or illustrations equally instantly.” That certainly characterizes my situation. Writing this book would have required, at one time, access to libraries that contained copies of all the original works through which I dug for information — the writings of Riccioli, Brahe, Ingoli, Lansbergen, etc. — and that implies far more time and money for the work than I have available, or could ever hope to have available, being in a small college in a modest city in Kentucky, physically cut off from etc. etc. But today all those works are available on-line, and I could do all this work from Kentucky. All those libraries that have made their rare books collections available on-line are to be thanked many times over. Also, there is far more material out there, available on-line, than anyone can handle. I would encourage anyone with a background in science who perhaps has some language skills to consider exploring untranslated works. You might just find yourself with an interesting discovery, many published articles, paid trips to cool places to give talks, a book, and a five star review with extra fairy dust by the R.M.! Better still, you might just really enjoy doing it. All thanks to the Internet. When did the astronomers understand the size of the stars. Do I have to wait for Amazon to bring the book? It is not an easy thing to explain, so you will have to wait for Amazon. The link you cite (which does mention the star size argument – hooray!) is almost correct. Galileo did argue that in fact the apparent size of the ‘stars’ (as seen with the naked eye) was an artifact of the human eye. He attributed this to what he ‘called adventitious rays’ (like glare). But, he applied this to all the stars – both fixed and wandering (i.e. planets). He thought the telescope revealed the true disks of all of these ‘stars’. In the case of the planets, it did. In the case of the fixed stars, it appeared to, but in fact the disk was spurious. The telescope improves sensitivity to parallax (and thus forces the stars to be further out) by roughly the amount that it shrinks the apparent size of the fixed stars. The net result is that the absolute sizes of stars remains a problem. Locher is talking about this as early as 1614, as is Marius. Peter Cruger, Hortensius, and Riccioli all note this – with Riccioli giving detailed procedures for how to measure star sizes telescopically so you can check out the problem for yourself. The link you cite has several other errors (all of which I, like you, was taught). The moons of Jupiter, phases of Venus, and changes in apparent sizes of Venus and Mars that the link mentions as being striking confirmations of the correctness of the heliocentric theory are all wholly consistent with the Tychonic model. A really fascinating point to consider is that Locher in 1614 argues that the moons of Jupiter support Ptolemy because they provide observational confirmation of the existence of epicycles (this is not in ‘Setting Aside All Authority’ – this from ongoing work that I hope to see published in a new book soon, but I can provide to those nerdy enough to be interested a link to Locher’s original Latin on this). Locher says Ptolemy postulated the existence of epicyclic motion to explain the movement of the planets through the constellations, but the Jovian system demonstrates epicyclic motion in action, proving Ptolemy was right. Thus Locher sees the Jovian moons as supporting Tycho. Like you, I was taught that the Jovian system was viewed as undermining Ptolemy, and here is a reasonable argument as to why it supports Ptolemy. In short, there is a lot more to the anti-Copernicans than we were taught. As I have blogged on more than one occasion the Jovian moons refute a part of Aristotelean cosmology but have no effect on Ptolemaic astronomy. There was no awareness of the Airy disk in the seventeenth century! You’re missing araybold’s point. The scaling argument he quotes works only if we assume that the apparent disk size represents the true stellar diameter. But the very fact that apparent disk sizes don’t change as they should with increasing magnification, is evidence against this assumption. If you look at Airy’s 1835 paper, it’s pretty clear he’s providing the explanation for a phenomenon whose existence was already accepted. In the Graney-Grayson paper, the first suggestion that we might be dealing with an optical artifact (in modern jargon) is ascribed to Huygens, in 1659. They do say that Huygens’ argument was “not necessarily convincing” to early astronomers, citing Flamsteed as an example. The next two data points Graney and Grayson give are 1720, Halley (the stellar disk is an “Optick Fallacy” because of instantaneous occultation) and 1805, Herschel (several arguments, including the one mentioned by araybold). Perhaps the book fills in the early history in more detail? (I have not yet received my copy.) In any case, it is clear that Tycho’s argument had lost its force well before Airy’s paper. By writing “Airy disk” I meant “that which we now know as the Airy disk”, and my point here is that aperture affects the image size of a star, but not of a planet (so long as the aperture is sufficient to resolve the planet’s disk, and I gather from what is written here that in the case of Galileo’s telescopes (and presumably those of his contemporaries and successors), it was.) This is a complicating factor in interpreting the size of a star’s image. In fact, with both Jupiter and a star in the field of view, you would not even have to do a calculation to see that the relative sizes of the star’s image to that of the planet would be different in the two instruments – the star would look smaller, relative to the planet, in the telescope with higher magnification (given telescopes of sufficient aperture to resolve the planet, hence my caveat.) The difference in the size of the planet’s image in the two telescopes could be accounted for by the difference in magnification (the ratio would be the same as for a terrestrial object viewed through the two telescopes.) This would leave the size of the star’s image in the two instruments an anomaly, casting valid doubt on the interpretation of its image size as a true measure of the star’s apparent size. In the period when the Airy disc star size argument was at its hight there was very little variation in the telescopes being used. Almost everyone doing telescopic astronomical observation would have used a Galilean or Dutch telescope with a 20X–30X magnification. Keplerian telescopes enabling higher magnification didn’t really come into use till after 1650 by which time a general acceptance of a Keplerian heliocentricity amongst European astronomers was taking place. after 1650 by which time a general acceptance of a Keplerian heliocentricity amongst European astronomers was taking place. From a strictly logical viewpoint, the accuracy of Kepler’s Rudolphine tables say nothing about whether a fully heliocentric system is preferable to a geoheliocentric one. Ole “speed of light” Rømer was, I understand, a convinced “Tychonian” until his death in 1710. Aberration of light doesn’t come on the scene until 1727. The existence of stellar parallax remains an issue until 1838. The “Coriolis” type experiments favor a rotating earth, but are consistent with a semi-Tychonic system. To what should we attribute the general acceptance of full heliocentricity post-1650? Newton’s physics, plus vortex theory? You are thinking too twenty-first century. Keplerian heliocentricity became accepted by about 1660 because the Rudolphine Tables calculated by Kepler were much more accurate than anything previously available. In the Early Modern Period an astronomical system was judged on the quality of its planetary tables.The acceptance of Keplerian heliocentricity was also aided by the empirical proof of Kepler’s First and Third Laws of planetary motion. The Second Law wasn’t accepted until later. I spend a bit of space in /Setting Aside All Authority/ on just this question of magnification and spurious disks — comparing hypothetical 20x and 40x telescopes. The short answer is no, different magnifications do not result in different star sizes. The image in a telescope (be it spurious or not) is formed by the object lens (at the front of the telescope). It is then magnified by the eye lens (at the back). A greater magnification magnifies everything in the image. I have a 2010 teaching article on this called “Is Magnification Consistent? Why people from amateur astronomers to science’s worst enemy have some basic physics wrong” which addresses some of this and which should turn up in a Google search. But the best way to understand what is going on is to get a telescope, mask the aperture down to about 1-2 cm, and observe some stars and planets. You will see why Flamsteed, for example, insisted that, despite what Huygens had to say, the telescopic disk of Sirius was as real as the disk of Mercury. It is very difficult to figure out that the disk seen when a telescope is directed toward a star is spurious, whereas the disk seen when a telescope is directed toward a planet is real, especially when, as ThonyC points out below, everyone is using small telescopes. It is difficult to be sufficiently precise when just typing a reply! I said “The short answer is no, different magnifications do not result in different star sizes.” I should have said “The short answer is no, different magnifications do not result in calculating different physics sizes of stars.” Differing magnifications will result in enlarging the spurious disk further. And it is also difficult to figure out why. Since the centre-to-centre separation of stars is a fixed number of arc seconds, their separation in the telescope image increases proportionately to magnification. But since the appearance of the spurious disks does not grow as fast as the magnification, they are reducing in size as measured by arc seconds. This is strong indication that the disks cannot be tied to a real physical object, since a real physical object cannot shrink by increasing telescope magnification. and you attribute this line of argument to Herschel. Doesn’t this mean that if we calculate the physical size of the star based on “size” of its Airy disk (as defined in detail in your paper), we get inconsistent results? Oh heck, you are reading *all* my stuff. I guess that is a good thing, but that paper with Grayson gets pretty technical. BTW, I still can’t get my typing correct. Further typo correction to my previous: ***I should have said “The short answer is no, different magnifications do not result in calculating different physicAL sizes of stars.” INCREASING magnifications will result in enlarging the spurious disk further. *** This is why I should stick to books and papers, and not be on the internet. Because, as you note, I just am confusing when I type “off the cuff”. Thanks for the technical stuff. That’s the really interesting thing here. Oh heck, you are reading *all* my stuff. You write so much fascinating stuff! I’m looking forward to reading your book. I love the technical stuff! As do, I’m sure, many other readers.